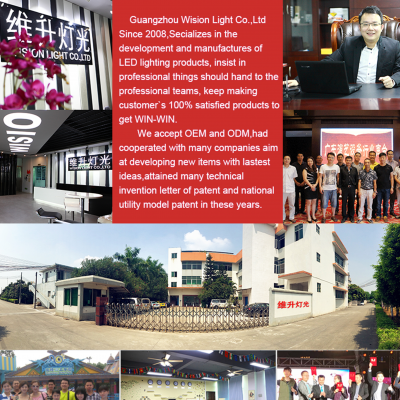 Guangzhou Wision Light Co.,Ltd Since 2008,Secializes in the development and manufactures of LED products,insist in professional things should hand to the professional teams, keep making customer`s 100% satisfied products to get WIN-WIN. We accept OEM and ODM,had cooperated with many companies aim at developing new smart wearable items with lastest ideas,attained many technical invention letter of patent and national utility model patent in these years. We use materials and recheck then before production,monthly capacity is 50000units,can delivery your orders in 7-10 days,All our products are CE- certified and come with one year warranty. We also welcome third-party inspections. Professional products, warm service,keep honesty and fiendly relationship is our always purpose for customers!